SnapSleeveTM high temperature, heat, flame, pyro and fire resistant sleeve and jacket provides molten splash & weld splatter protection to wires, cables, hoses, tubes and pipes. SnapSleeveä provides a field installable protection sleeve utilizing metal snaps instead of hook and loop closure strips. Although sleeve with hook and loop closure provides excellent protection in most harsh environments, only SnapSleeve can endure the most demanding of liquid metal splash and heavy weld splatter. This sleeve also provides energy savings and personnel protection. 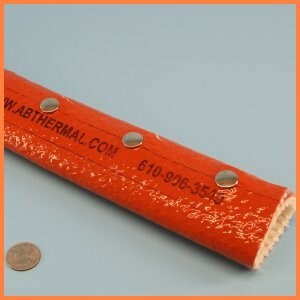 Snaps are typically installed at 4 or 6 inch spacing along the sleeve. Additional snaps may easily be field installed to allow for unique bends or extra closure protection. Available in sizes from 1" through 12" ID. Other larger sizes available.